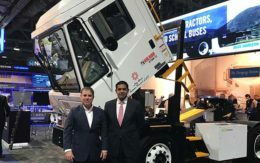 Meritor, a global manufacturer of conventional truck drivetrain components and systems, is getting into the electrification game. The company is the largest axle manufacturer in the world and also supplies brakes, suspensions and all-wheel– drive systems — essentially anything under the frame — to all major truck manufacturers. But the trucking industry is undergoing transformation. Customers are demanding electrical components to increase efficiency and drive down operating costs, said John Bennett, Meritor’s general manager of global product strategy and advanced engineering. His team is responsible for developing and executing an electronic mobility strategy, which means he flips the switch to the future. Trucks.com sat down with Bennett to discuss how Meritor is tackling the new age of trucking. What is Meritor up to? We are [launching] our Meritor Blue Horizon technology brand that we’ve developed with TransPower. It’s the brand for all of our advanced products that includes electrification products, high-efficiency products and connected products. Blue is the new green. TransPower is a provider of electric drive systems, including what is essentially a turnkey system. That would include the battery pack, the battery management system, the power electronics, the vehicle controls, the electrified accessories and all of the integration work. They can do — ‘soup to nuts’ — everything that needs to be done. With TransPower we can work with a truck maker in developing and electric vehicle or they can deliver a glider to us and we will deliver it back to them as a fully configured electric vehicle. TransPower is essentially a technology company. They started about eight years ago. We’ve taken an investment position so Meritor can offer to our customers fully integrated electric drive systems. Does the Blue Horizon brand have global reach? The system could be deployed in multiple regions. It will likely need to be modified for each region, but that’s more application-type modification support that we do even with our conventional products. There’s lot of flexibility built into the e-axle design. When will these components hit the road? We have a proof of concept with Peterbilt that will start this summer and last about one year. Peterbilt is testing 12 Class 8 day cabs and three refuse trucks in real-world service conditions alongside conventional diesel-fueled trucks. The day cabs will go into service as drayage trucks and will support operations throughout California, including Los Angeles, Long Beach, San Diego and Oakland. One of the refuse haulers will be tested by Sacramento County and the other by a waste hauler. All testing is designed to confirm range capabilities, operating hours and charging requirements. Is electrification a trend that’s bubbling up in the industry? We’ve heard it from just about every customer. Some customers want turnkey systems, some want components. We are positioned to do anything on that scale. For example, we are developing the entire system for Peterbilt. There are other manufacturers that we are working with like Volvo where we are delivering just the e-axle, so they can do the integration. We are happy to play where ever our customer wants us to. Aside from electrification, we are doing a lot in terms of improving the efficiency of our axle and even our brakes. We are investing in a lot of different technologies that in some cases will complement the electrification but can also be used on conventional vehicles with a diesel engine that are looking for better fuel efficiency and lower carbon dioxide emissions. Is the testing related to air-quality initiatives set by the California Air Resources Board? Yes. A lot of the focus is in California for that reason. There’s a lot of funding, there’s a lot of legislative initiatives to promote advanced technologies in this space. But we are seeing that not just in California. Within the United States, this is the hotbed of activity. But you also see it throughout the U.S., and we see it globally. Europe is really pushing this, and China is in front of everybody. We sell product in all these regions, so being a global company we can develop a technology and see application for it across the globe. India is coming up on the heels of everybody and, depending on who you listen to, India could pass up Europe and North America here soon because they are really starting to focus on cleaning up their air quality. Do you think electrification will ever make sense for the long-haul industry? That’s probably the most challenging duty cycle for a number of reasons. We absolutely believe the applications that have defined routes and come back to the same loading or docking facility overnight will be the first to take off. The medium-duty pickup, delivery vehicles and refuse trucks run consistent routes and allow downtime for charging. Long-haul trucks will need a bigger battery pack and time to charge it. It will also need a much more extensive infrastructure. Where does connectivity fit into all of this? 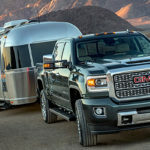 The connected piece is having the product — either electric or conventional — being able to talk to the driver and the fleet manager. It will require the integration of sensors and development of analytics to turn into actionable information. The product usage data will also go back to Meritor so we can better understand duty cycles and thereby optimize our products. What is Meritor’s position on trucking’s autonomous future? The industry is active. There are a number of companies that have been testing [autonomous] technology. We will be feeding into those systems. We are not driving that technology, but we’ll be providing braking, diagnostic and prognostic type of information into those systems so our systems can react accordingly. Braking is one that we see is a more likely fit for autonomous vehicles. Without a driver, the braking system is an enabler for the adoption of that technology. Platooning will certainly come first. You’ll have platooning with drivers, and at some point the second vehicle may not have a driver, which will be the first part of autonomous. Ultimately both vehicles, multiple vehicles, will be without the driver. As the first step, vehicle with drivers platooning, you want to shrink the gap in between the vehicles as much as you can. There is actually an ideal position. But as you shrink that gap you want to make sure the second vehicle has the right stopping power. You need to have a highly reliable braking system. This is where our brakes, having the embedded sensors and constant monitoring of brake health, will make sure the system is going to be reliable and safe.